If you're trying to gain weight after periods of stress or illness, it's tempting to reach for the potato chips or get takeout. While junk food may be a quick and enjoyable way to gain weight, these foods are also high in unhealthy saturated and trans fats. They not only cause sluggishness, but they also raise cholesterol levels, which increases the likelihood of contracting coronary conditions, such as heart disease. However, not all types of fat are bad for you. 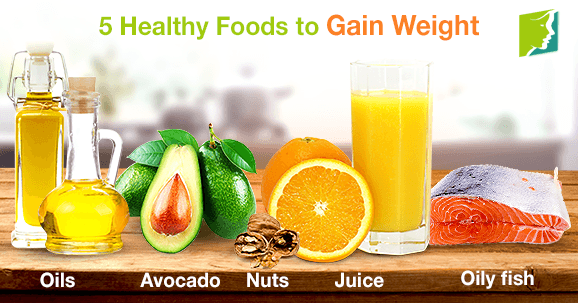 Learn more about healthy foods for weight gain. It is a myth that all fats are bad for you. While the long-term consumption of saturated and trans fat-heavy foods - such as junk food, fatty cuts of meat, cheese, and cream - can cause coronary diseases, monounsaturated and polyunsaturated fats are healthy fats that the body uses for energy. These fats replace saturated and Trans fats and help to build up cell membranes and sheaths surrounding nerves in the body. Nuts contain high levels of monounsaturated fats, so snacking on them between meals is a great way to boost your healthy fat intake throughout the day. It is easy to disregard avocado as a food for weight gain, but this fruit contains high quantities of monounsaturated fats. Not only will these fats help you gain weight, but eating avocados also helps lower cholesterol levels, provides fiber to aid digestion, and acts as a source of potassium for healthy cell, tissue, and muscle growth. Olive oil, vegetable oil, and sunflower oil are all excellent sources of monounsaturated and polyunsaturated fats. Cook with them as an alternative to butter, which is heavy in saturated fats. You could also try dressing salads with olive oil to aid weight gain in a healthy way. Oily fish, such as salmon, herring, and trout, are rich in omega-3 fatty acids, which are polyunsaturated fats healthy for weight gain. Omega-3 is also a powerful antioxidant to boost the body's general immunity and a valuable nutrient in the prevention of heart disease and strokes. Increasing your consumption of fruit juice is a great way of adding extra calories to your diet without feeling too full. Drinking fresh orange juice with or between meals provides immune-boosting vitamin C while contributing to your calorie intake. Increasing fat intake doesn't have to mean feeling bloated, sluggish, or unhealthy if you avoid saturated fats and opt for monounsaturated and polyunsaturated fats instead. Continue to exercise regularly, but reduce cardiovascular activity and increase weight training to build muscle mass instead. It is particularly important to put on weight sensibly and healthily if you are emerging from a period of vulnerability, be that illness or stress-related. Remember to be patient. Like weight loss, healthy weight gain takes time.